Amazon is wooing cinema owners. Watching movies on your phone is not the same as seeing it in a cinema. That was the message sent by filmmakers, including Christopher Nolan and Sofia Coppola, who showcased their upcoming films to theater operators during the annual US conference called CinemaCon last week. “I hope people see it in the theatre, where it was meant to be seen,” Coppola said. Nolan’s much-anticipated Dunkirk is shot on 65mm film and you need a screen the size of a building wall to really take advantage of that format. “I am depending and relying on all of you to try to present this film in the best way possible,” he told the exhibitors. The streaming darling has bucked industry convention by releasing its own films online without any theatrical distribution. And if they are released in cinemas (generally to qualify for awards), they come out online the same day they hit the big screen. Most movie studios offer cinemas an exclusive 90-day screening period for new releases. As such, exhibitors including major chains like AMC and Regal and independent theaters, have mostly written the streaming service off. Amazon showed it could and would work with the theaters, though. It said last year that it would wait the traditional 90 days after its films were released in theaters to make them available on Prime streaming. And the move has paid off for the fledgling film company. 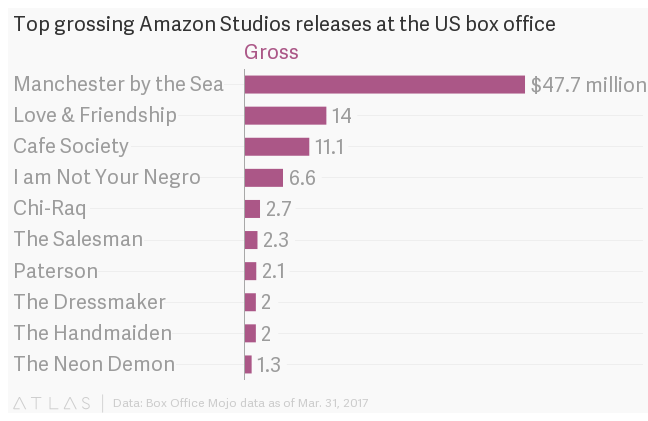 Amazon’s films released since then, including Kenneth Lonergan’s Oscar-winning drama Manchester by the Sea. Collectively, have grossed more than $90 million at the US box office, according to Box Office Mojo. The studio has also held firm on its commitment to the 90-day windows at a time when other major US studios like Fox and Universal have pushed to get new releases in the home quicker. “I think we proved to you that we really believe in the theatrical experience by fully supporting the theatrical window for our releases,” Ropell told audiences at CinemaCon. He was reportedly rewarded with rousing applause. Amazon has about 15 new movies slated for release this year, including The Big Sick, produced by Judd Apatow, Woody Allen’s Wonder Wheel, and the Brad Pitt-produced The Lost City of Z that could benefit from box-office runs. As for Netflix, the service is continuing to do things its own way. It appears the company is content with limited releases at luxury-theaters chains like iPic, with which Netflix has a deal to screen some of its upcoming pictures. That seems to be the case even as it’s poised to release its biggest films yet: War Machine, with Brad Pitt, and David Ayer’s Bright, starring Will Smith. Meanwhile, both Amazon and Netflix are upending long established business models in film and TV, from how shows are funded globally to how much stars are paid.